Skip bags serve as the perfect alternative for when your waste disposal needs aren't on a scale large enough to justify the hire of a full skip, since they're often cheaper. 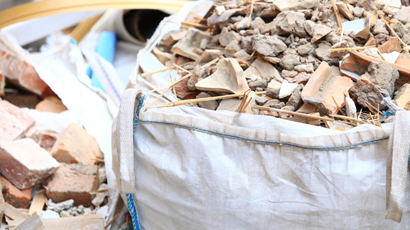 Strong yet flexible, skip bags are ideal for the removal of household waste, small-scale DIY scrap, and bathroom and kitchen rip-outs, making them one of the best options for modest jobs on domestic properties. We Will Collect Any Bag! Trade Skips will collect any bag providing it is in the right condition and is accessible to our trucks. The bag doesn't have to be a Trade Skips branded bag, it can be aggregates bag that you have reused for your waste or a branded bag from one of our competitors. Just call us us to arrange a collection and we'll pick it up at a fraction of the cost of what you would normally pay. Skip bags are especially adept, however, at accommodating garden waste disposal. Thanks to their flexibility compared to a regular skips, skip bags can fit into spaces around the sides of house to give you easier access when cutting away garden waste, such as branches and weeds. Small garden waste bags can even be carried around to different sections of your property, and can be retrieved over walls and fences, making any garden waste disposal project as easy as possible. Make sure that your skip bag is set up within 4m of the nearest lorry-accessible road (at least 4m in width), giving a wide berth to any aerial obstacles such as trees or high walls. Ensure that the heaviest materials are put in your skip bag first, so that they sit at the bottom when we come to collect it, and that the lifting straps have a clear radius. Call us on 0330 077 0032 when your skip bag is ready for collection, and inform our staff on the location of your skip bag within the proximity of your property. Please be aware that any restrictions to accessing your skip bag may affect that collection service. We'll collect your skip bag within 5 working days after your booking. As with ordinary skips, you may need a permit for your skip bag depending on your local council if you wish to place it on the road or pavement. Remember to check with your council before hiring. Once you've hired your skip bag, you'll have one full year to use our prepaid bag and collection service. Please be aware that you may incur additional charges should you wish for your bag to be collected after this time. Skip bags are easy-to-use, strong, and cost-effective, making them the ideal option for any small to medium-scale job. Hire yours with Trade Skips today.